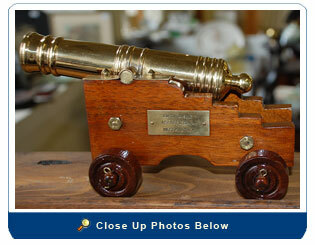 This is a hand-made reproduction of the cannons used on the USS Constitution. 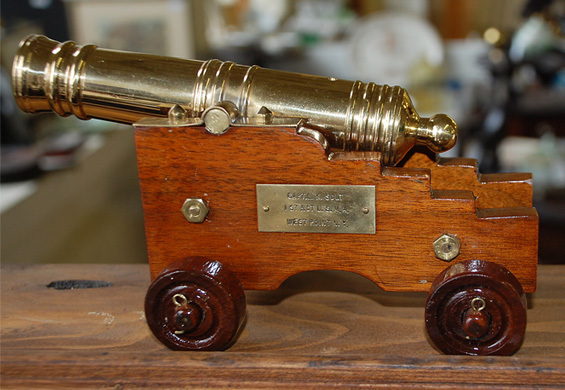 The barrel is solid brass and the carriage is constructed from Honduras Mahogany. This was presented to Capt. L.K. Solt as an offers recognition award from West Point in the early 1950s (see brass plate). We completely disassembled it and restored it back to near original condition… all the brass (barrel and fixtures) were polished, buffed and coated with a clear brass lacquer and the carriage was refinished with 3 coats of marine spar varnish. This is a high quality and rare piece of military memorabilia.